I so appreciate your interest in the blog posts I’ve written about gender and rhetoric that emerged from WOMEN SEEN AND HEARD (Lois Phillips and Anita Perez Ferguson, Luz Pub, 2004). 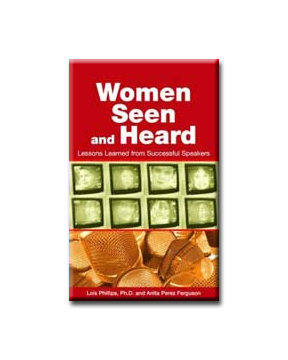 Building on what we learned from our research and consulting experiences, Anita Perez Ferguson and I have just published another book, WOMEN SEEN AND HEARD SPEAKER’S JOURNAL: Workbook & Templates, which is also available as an E-book. The Templates were specifically designed for women to allow them to easily organize their unique content into a flawless presentation. The SPEAKER’s JOURNAL provides templates for 9 types of presentations they might deliver, from the Informational, Inspirational, Persuasive, and Humorous presentations to the “Small Wins” Briefing, and even a Cheat Sheet for delivering a perfect Wedding Toast! Given how busy women are today, these templates will save time and force focus. The book endorsements from stellar women (three examples below) motivated us to get this book out pronto, particularly after the revelations emerging from #METOO and #TIMESUP phenomena. Click on any of the links below to order your copy today! Freedom of speech is a right, so I hope you take advantage of it in your sector, whether business, education, government, or politics. The Women Seen and Heard Journal: Workbook and Templates provides women readers with the opportunity to explore the basis for any reticence they might have as public speakers. The Journal will develop self-awareness with regard to her own values, interests, ideas and opinions. There are more opportunities for women to advance into leadership roles, but for women to become leaders, they need to develop mastery of presentation skills in a range of situations, to include speaking up in business meetings to presenting a formal presentation at a conference, pitching to investors or donors, or running for office and speaking to the press. 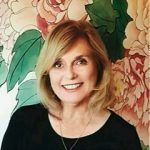 The chapters provide prompts that will allow each woman to respond privately -in her own separate journal- as she explores her family/work/travel history and how that affected her communication skills. Chapters focus on a woman’s role models, assertiveness, authenticity, gaining credibility at the podium, and preparing for a career as a professional speaker. The Templates provide fool-proof worksheets for organizing 9 different types of presentations. The authors are professional speakers with media experience and share what they know from their own experience and coaching others. Click here to buy from Barnes & Noble. “When it comes to corporate business as of 2018, only 4.8% of Fortune 500 CEOs are women. How can this be? Having vision and intellectual ability are not enough for women to attain high level corporate management positions anywhere near parity with men. CEOs require a particular skill set that include presentation and self-promotion skills and a forceful delivery style, leadership qualities that woman are historically less comfortable with. Specifically, it seems to me that most women are not socialized to be unapologetically competitive. To advance, women need insight into ways to convey strength and command. The Women Seen and Heard Speaker’s Journal gives invaluable insight and many chapters of thoughtful written journal exercises that will provide women with everything they need to attain their leadership goals. 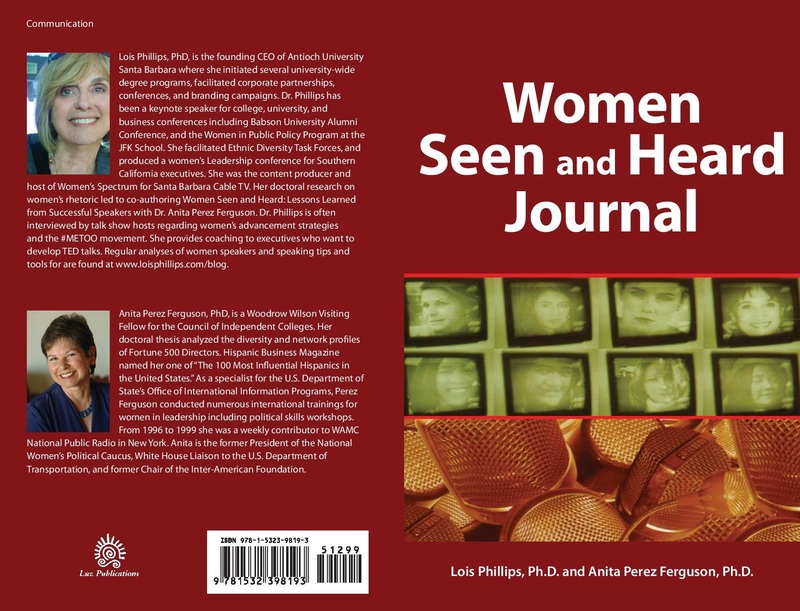 Lois Phillips, PhD and Anita Perez Ferguson, PhD; Luz Publications, 2004. I just heard from Anita Perez Ferguson and learned that the two of you are working together. What a fascinating life you lead! I hope we can meet somewhere other than airports. My foot is healed and I’m feeling fine. Maybe we can get together for a glass of wine or whatever? I would love to see you again.